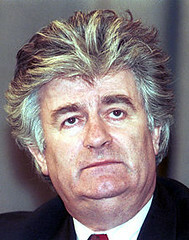 There are probably very few people in the United States who are interested at all in the trial of Radovan Karazdic, former President of the Republica Serpska, and the leader of the Bosnian Serbs during the Bosnian war of the mid-90’s. For myself, it has been a long emotional journey, even though I was only a part of the beginning of the search for him. I wrote two summers ago, when he was captured, about the paradox of this man who is responsible for some of the worst atrocities of that war being found hiding in plain sight as an herbal and alternative medicine salesman. The trial of Karazdic may indeed be one of the final pieces of my healing from that war, no matter how it goes. I had given up hope of his ever being found, much less held responsible for what he did. I bore witness to the aftermath of some of his atrocities, and I was on the team that began the search for him. He may have chosen not to show up for the first day of his trial, but I was there… in spirit at least. And so were the spirits of the tens of thousands he killed. May they also find some peace. Bosnia effected me very much. I was agast at how the world watched while that unfolded and did nothing.